Daniela Valentini showed interest in Art from a young age. Her passion for the creative was never discouraged by her parents, both professionals in the health area, but stimulated with enthusiasm to follow her dream to become a painter. Daniela graduated from Universidad de Chile with a Bachelor in Fine Arts. In 2007 she wins an exchange-student scholarship to complete a semester in UCLA. In her school years is where her main interest for oil painting began and where her technique started to be perfected. With teachers as Enrique Matthei, Catalina Donoso, Gonzalo Diaz, Natalia Bararovic and Pablo Ferrer, among others. And from UCLA teachers as Matthew Greene. Taking as inspiration great artists as Gerhard Richter, Georgia O’Keeffe, Alphonse Mucha or Tamara de Lempicka. Daniela is characterized by using painting as a mean to portray everything she believes is beautiful. Focusing in the beauty of the different, in colors and life itself. At this moment she feels attracted to orchids, considering these flowers unique, different, strong an delicate at the same time, but among all: because of their adaptability. At the same time she has explore different mediums as watercolor, portraits in pencil and illustration. She also enjoys painting portraits or experimenting with her photographs and mixed media. 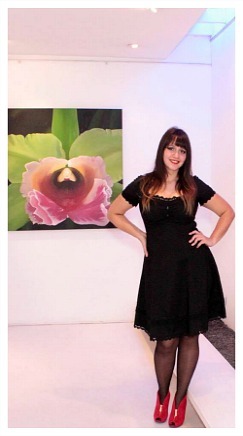 She has exhibit works in Santiago, Chile, Ovalle; Paris, Miami and London.